Each year each state nominates one high school player to play in the Denker Tournament of High School Champions held in conjunction with the US Open. This year’s Oregon representative was Aaron Pikus (School of Science and Technology, Beaverton), winner of the high school elite section at the OSCF State Championship. The Denker is perhaps the strongest scholastic tournament in the USA. Nearly a third of this year’s players were Masters (rated 2200+) and about half were rated above 2000. 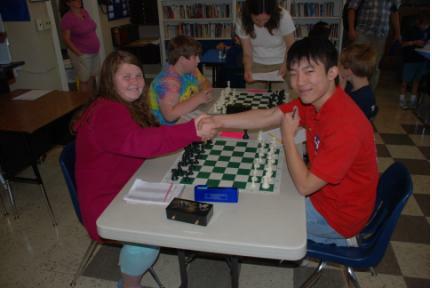 Despite being 500 points lower-rated than the average, Aaron played great chess, scoring 2.5/6 and tied for 32nd-36th. All but one of the players finishing ahead of Aaron or tied with him were at least 100 points higher-rated. Excellent work, Aaron! Beginning this year, each state can also nominate one K-8 player to compete in the Dewain Barber Tournament of K-8 Champions, also in conjunction with the US Open. This year’s nominee was David Wen (Cheldelin Middle School, Corvallis), co-champion in the middle school division at the OSCF State championships. David was chosen over the other co-champion, Erik Skalnes (Roosevelt Middle School, Eugene), because Erik had a schedule conflict with the Barber. Otherwise, they’d have had to play a match to determine the Oregon representative. David was a great Oregon representative and ended up with a respectable 2.5/6, tying for 27th-33rd. Congratulations, David! 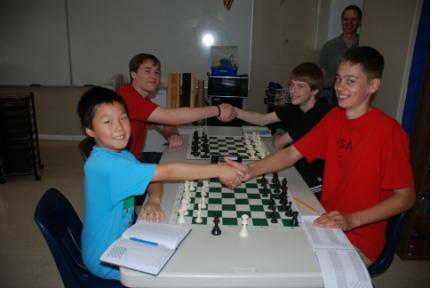 Eighteen players came to Corvallis on a scorching hot day to play some cool chess at Zion Lutheran School. All earned an enamel dog print pin while battling it out for the “full dog” trophies awarded to the top three finishers in each section. In addition to chess, players engaged in some basketball, dodge ball, video games, and celebration of Marjorie Sheiman’s birthday with cupcakes, grapes, and strawberries. Full results at NWSRS. 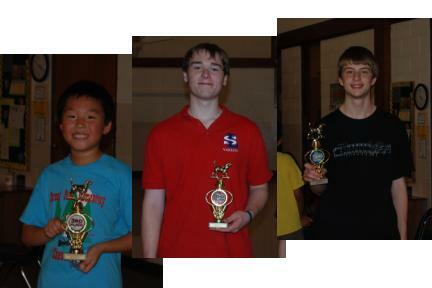 Marshall Xu, Alex Petersen, Matt Dalthorp, and Tucker Price played a double round-robin in the open section. Matt had a substantial rating advantage over the others and ended up with a perfect 6/6 after getting a scare in the final round against Marshall. Alex hadn’t played a single game in many months but showed little rust in scoring 3/6 for second place. Although much younger than the rest of the players in his section, Marshall was not at all intimidated and scored 2/6 for third place. After losing the final game and scoring only one point overall, Tucker was upbeat and pleasant and earned himself a “full dog” for Good Sportsmanship. 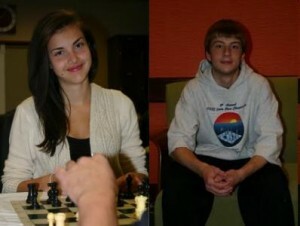 The six players in the advanced section, played a 5-round round robin. The results were as clear as possible: no ties for any place. The intermediate section was a five-round Swiss with eight players. The day ended with high drama in the final round. Max Franklin had a perfect 4/4 going into the final round but he was slated to meet Jeff Wang (3/4) for first place. Max’s position fell apart early, and Jeff was able to clinch a tie for first by winning in short order. That left four players in contention for third place. Kevin Dai and Adrian Camero won their games early to finish at 3/5, while Fedor Semenov (2.5/4) played a long, close game against Atticus Crow (1/4). A win by Fedor would put him in clear 3rd, a draw would mean a three-way tie for third, and a loss would mean a tie for third between Kevin and Adrian. Fedor and Atticus played a well-balanced game and went into a rook and knight endgame with both players having several pawns. They traded off most of the pawns before Fedor won Atticus’ rook. Fedor then played like a grandmaster — confident and without hesitation — to checkmate with rook and king to win the final dog trophy. SwissSys is the premier tournament pairing software for US events. It is an essential tool for organizing tournament player data, making pairings, keeping track of scores, calculating tie-breaks, formatting standings and wall-charts, formatting final cross-tables for submitting results to USCF or NWSRS for rating. For Oregon TDs SwissSys is essential because: i. NWSRS has a custom registration program (free) that makes it very easy to enter player data into SwissSys, and ii. NWSRS-rated tournament results MUST be submitted in SwissSys format to get rated. OSCF now offers discounted copies to OSCF-affiliated clubs and TDs for $59 (retail $99). Contact oscf@oscf.org to order. 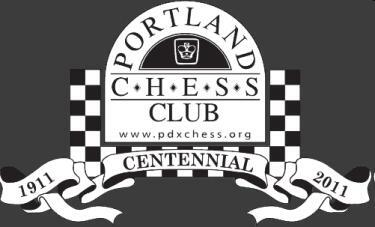 There is a brand new Corvallis Chess League. We meet once per week to play one USCF-rated G/90 game. The league is open to all USCF members but because of the long time-controls, it is well-suited for more mature scholastic players and adults. There is no cost to join and no awards given out. It is just a good opportunity to keep sharp, prepare for other events (like the PCC Centennial Open, the August Albany Open, Oregon Open, etc. ), or just to enjoy one high-quality rated game per week with chess friends. We meet Tuesday evenings at 7:00 in the Community Room upstairs at the Corvallis Market of Choice on the corner of 9th and Circle. Contact onco111@yahoo.com for more info.